Today is my last day of solo travel, starting this evening I won’t be alone again until who knows when. If I was an extrovert that thought would probably excite me, but as an introvert it scares the crap out of me! Knowing me-time would be instantly constrained soon, I tried to catch up on writing, emails/texts to friends, etc. Before I knew the morning had vanished and I was heading to breakfast at 11am. For an INTJ, that is like nails on a chalkboard. Although the Hawaiian Monarch Hotel will be receiving a thumbs down, something I rarely give as I am usually quick to excuse whoopsies, the little French breakfast restaurant in the lobby was actually quite delightful. I will agree with the reviews online it was overpriced, but the food was delicious. Much higher quality than the typical Waikiki tourist joint. Outside the window was the endless blue skies and bright sun shining intensely down on the Ala Wai canal. Canoes were out and people were rowing left and right. As the sun reached it’s highest point in the day, I meandered over to the beach by the Hilton Hawaiian Village to get a little sunshine beach time in after 36 hours of just knowing it was close but not getting to experience it. Absolute torture! 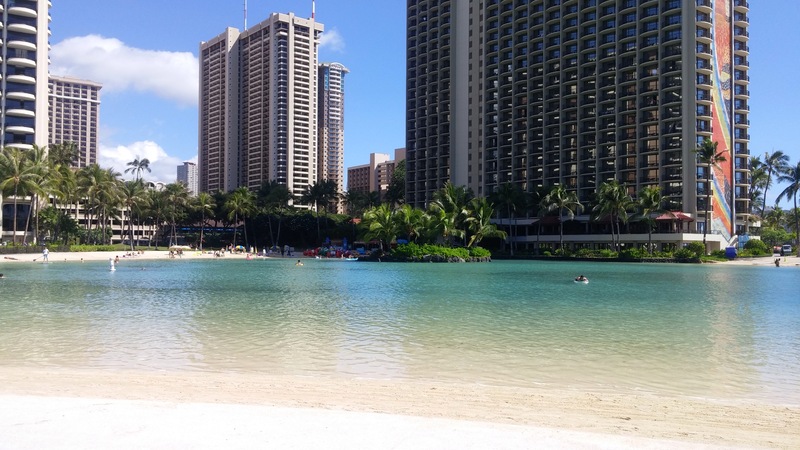 One of my favorite things about the Hilton Hawaiian Village is they have a little ‘lake’ with ocean water that’s completely enclosed by beach. There are no waves and no sharks, you are in ocean that’s tamed and calm. I recognize many people would find that boring, though I find that absolutely remarkable. I laid my tiny little packable camping towel on the lush green lawn by the ‘ocean lake’ and nestled in for the afternoon. The water was chilly and even a few minutes of attempting to acclimate did not do the trick. I elected to lay awkwardly trying to fit on my 2×3 foot teeny towel in the shade of the tree next to a cat lounging in the bushes. The sound of the ocean lapping in the background, the hollers of children bouncing around the ‘ocean lake’, life was instantly wonderful. Shortly after the duck drama ended, a good looking man sat down next to me with his golden brown skin and tattoos. His daughter was out of school, apparently Hawaii has a week long holiday which would explain why everything was crowded. As she played in the water, we chatted about where we were from, travel, Mongolia, divorce, single parenting, dating, gender roles, and everything in between. Before I knew, hours had passed and his daughter had designed intricate sand castles with some other kids. He invited me to join him to watch a local band that evening then my phone chimed and it was time for me to go. I had someone coming in from New York and went to the bus stop to meet them saying good bye to the beautiful beach and ocean breeze. After spending some time in the hotel to settle in and get sorted, we walked the down town strip of Waikiki, a must for any first timer to Oahu. The streets were just as crowded and packed as they were the night before. We walked the whole strip all the way down to the zoo at the far end where Waikiki abruptly ends. One side is jam packed with modern buildings, the other side with grass and nothing-ness. The shops were all decked out for winter, their corporate offices stocking the local stores with chunky wool sweaters and fur coats. As we walked in the 80 degree heat I couldn’t help but wonder how successful they were at turning the winter wear here. Given the proximity to the ocean, there’s something about being in Hawaii that just makes you crave sushi. With both of us having raw fish on the brain, it was the perfect opportunity to go to one of the best sushi restaurants in town – Nobu. I admit Nobu in New York is good, not great, but Nobu in Waikiki is amazing. The fish are so fresh and if you sit at the sushi counter you get spoiled with amazing off the menu concoctions that create for the most magnificent night.